Following a review, Arts Council England awarded The Helicopter Museum Full Accredication status, in December 2018, for a further five years. Although the collection was first accredited in 1997 and more recently in 2013, this time it had to go through a new, revised and more rigorous process to achieve success. Chairman of Trustees, Elfan ap Rees, said: "The award is a reflection of the dedication and hard work put in by the staff and volunteers, led by General Manager Lee Mills, and is especially pleasing as it recognises that The Museum meets the same high standards as leading professional museums across the UK". The Museum relies entirely on visitor revenue and donations for its day-to-day operation. Accredication opens the door to occasional grants from organisations, including the Heritage Lottery Fund. Currently The Museum is in the process of constructing a replacement entrance and services building, seen in the photograph (above/left) on 9th February 2019, which will house new retail and catering facilities, together with an education/lecture suite and enhanced offices while providing additional display space and an expanded archive with library. The shell of this extension, including the concrete floor, exterior walls and window/door frames, was completed by mid-February 2019 with fitting out due to take place through 2019. However The Museum currently has insufficient financial reserves to complete this work and is seeking new volunteers and sponsors for this phase of the development. To further accelerate the project The Museum recently applied for a small grant from the Heritage Lottery Fund, aimed at developing an introductory display, in the new entrance building, around the collection's 1931 Hafner R2 - the world's oldest surviving helicopter. The renewed Full Accredication status is expected to now strengthen that bid. The Museum continues to open normally, while re-development work proceeds, with entrance facilities relocated to the main exhibition hangar. 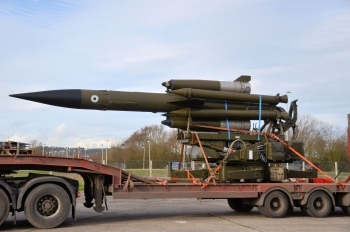 A Bristol Bloodhound Mk2 surface-to-air guided missile, complete with launching platform, was delivered (left) to The Helicopter Museum on 16th February 2017. It had previously acted as gate guardian outside The Royal Air Force Museum, Hendon. Bloodhound Mk2 missiles were manufactured by Bristol Aircraft in Bristol and Cardiff, the Thor ramjet engines were developed at Patchway while the four Gosling booster rockets were produced at the Bristol-Aerojet factory between Locking and Banwell villages. Ferranti, in Wythenshaw and Edinburgh, developed and built most of the missile guidance and launch control computer electronics. The Mk2 missile started to replace the earlier Mk1 in 1964, in its primary role of defence of the RAF V-bomber airfields in the UK. 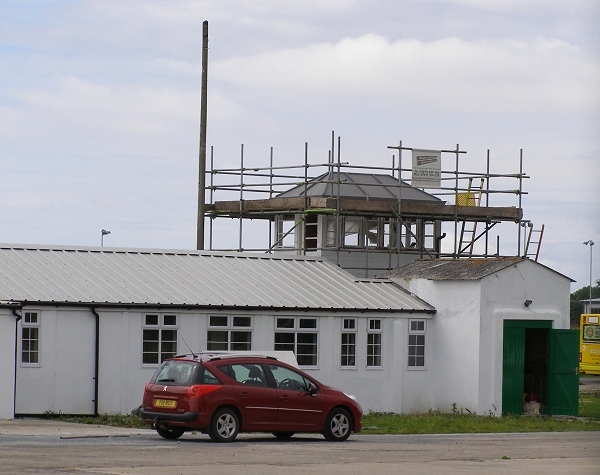 In 2015 The Helicopter Museum received a £138,500 grant from the Coastal Communities Fund towards the restoration of the unique control tower and the 1940s pilots block, adjacent to the Museum entrance, on the old Weston Airport. The tower made use of a 1920s cab shelter, relocated from the sea front in Weston-super-Mare when the local council built the original grass airfield in 1935. Scheduled air services started in 1936 using the de Havilland DH.84 Dragon. It was hoped that the work would create 16 new jobs as extra events are created while historical research and display work expands. The Coastal Communities Fund was created in 2012 for investment in seaside towns to help them achieve their economic potential, reduce unemployment and create new opportunities for their young people. Restoration of the pilots block and control tower made good progress after work started in Spring 2015. Alison Page, the Museum's Project Manager for this Coastal Communities Fund enterprise, has described how the roof was replaced and new windows installed so that work on the interior of the building could be completed as the 2015/16 winter approached. The buildings have since been transformed into a new Museum, ceremonially opened on Saturday 8th April 2017, which tells the story of Weston's Aviation Heritage including Weston Airport, Western Airways, RAF Locking and local aircraft factories. Photographed (left) in August 2016, work on the pilots block, including installation of upgraded power supplies and telecomms, was nearing completion while work on refurbishment and partial rebuild of the tower was shown to be still in progress. Friends Membership - Winding Down in 2015. We regret that the present membership scheme of The Friends of The Helicopter Museum is being wound down. Membership is closed to new applicants and no membership renewals can be accepted. Membership cards, allowing free entry to The Museum, will expire at the end of this year - 31st December 2015. We are in the process of clarifying with the Museum Trustees as to whether free entry for Life Members can be extended for a longer period. The Museum itself will now provide a quarterly newsletter - but delivered by email. Can all Members who wish to receive this newsletter please let me have your current email address via my answerphone on (01934)823312 or by post to me, Dave Wallace, 31 Old Banwell Road, Locking, Weston-super-Mare, BS24 8BT. This will be passed to The Museum. The newsletter will be a free service - no membership fee will be needed. The Friends will continue as a localised fund-raising group. £500 has been passed over for this financial year. Please continue to support The Museum in this new, free, way. Thank you for all your support and patience over the past few years. My personal apologies for not finding a way to provide you with regular newsletters - our committee has been very small over the last couple of years. D.Wallace. Statement from Dave Wallace on 21st November 2015. The Museum Trustees have now confirmed that ALL Friends Membership Cards will have their benefits withdrawn at 31st December 2015, including those of Life Members. A new Museum-run, email-based, membership scheme is mooted for 2016. Please let me have your email addresses so that you can go on this list and receive the free newsletter. We have now passed over another £100 making £700 so far, and will be attending the Christmas Fayre with our variety stall. Thank you for all your support and I hope you will embrace the new free scheme on offer. Best Wishes. G-BKGD returned home on 30 July 2015 after five years on loan to City of Bristol College, who conduct engineering training for a number of major companies within the aircraft industry. G-BKGD was the second WG-30 prototype, built at Yeovil and delivered to British Airways Helicopters (BAH) in October 1982. It was initially based at North Denes to service the gas drilling industry in the southern North Sea but subsequently spent three years on the Penzance/Scilly Islands scheduled passenger service. It was finally withdrawn from use in April 1993. 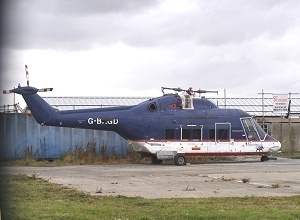 On transfer to The Helicopter Museum in 1995, G-BKGD was intended for use as an engine running demonstrator but remained in storage until 2010. The American Helicopter Society (AHS) has presented Friends Member, David Gibbings MBE, with their prestigious John J. Schneider Historical Achievement Award for 2015. The annual award, presented on 6th May 2015 at their 71st Annual Forum in Virginia Beach, recognises distinguished achievement in encouraging appreciation of, and enhancing access to, the history and legacy of vertical flight aircraft. David Gibbings joined the Royal Air Force, in 1949, as an apprentice and subsequently trained as a navigator. He joined Fairey Aviation, in 1955, to work on guided weapons. In 1959 he transferred to the Fairey Aircraft Division, in Hayes, to work on Rotodyne tip jets and to fly in the Fairey Rotodyne as Flight Engineer. After Westland acquired Fairey in 1960 and on conclusion of the Rotodyne programme in 1962, he worked on the new Wasp and Scout helicopters before moving to Yeovil in 1964. After three years in the Westland Flight Test Department at Yeovil, he was appointed Project Flight Test Engineer for the new Lynx programme, in 1967, and flew in the first prototype, XW835, on its maiden flight on 21st March 1971. After periods as Helicopter Icing Trials Manager from 1977 and Deputy Chief Flight Test engineer from 1980, he was appointed Chief Flight Test Engineer in 1989. He remained in that post until retirement in 1993. Since then he has continued to work, in the UK and overseas, as an engineering author, consultant, lecturer and aviation artist. David has reminded us that he is following in the footsteps of our founder, Elfan ap Rees, who received the same award in 2008. It is a matter of some pride that two recipients of this award are associated with The Museum. David published his book "A Quiet Country Town", in 2015, celebrating 100 years of Westland as an aircraft company. A new exhibition opened at The Museum on Saturday 3rd January 2015. "The Helicopter Museum at The Movies" told of the part that rotorcraft have played in films from the latest blockbusters all the way back to the black and white features of the 1950s. The exhibition was retained until mid-April 2015. On display was a section of the Whirlwind helicopter, G-ANFH, from "A Hard Day's Night", which featured The Beatles, also the actual Lynx helicopter parts that appear in the 2014 Tom Cruise epic "Edge of Tomorrow". 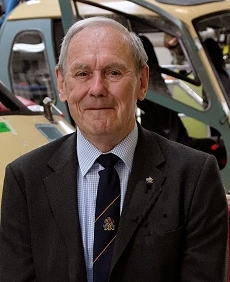 In a ceremony at The Helicopter Museum on 25th September 2014, John Wood, Chairman of The Institution of Mechanical Engineers' Heritage Committee, presented their Engineering Heritage Award to AgustaWestland for developing the world's fastest helicopter. A modified Westland Lynx, G-LYNX, broke the world speed record when it reached 249.09 mph flying a 9.3 mile course over the Somerset Levels on 11th August 1986. The record remains unbroken. Mr. Wood said "G-LYNX is a remarkable example of British engineering and vision. It is testament to the cutting edge modifications made to the helicopter that the world speed record still stands 28 years later". 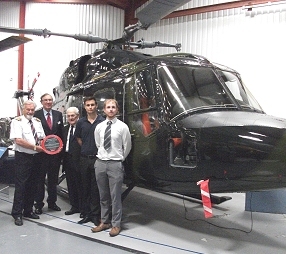 "This award is in recognition of all the people involved in making the 1986 record possible, but also to the AgustaWestland apprentices who restored the helicopter in 2011 and The Helicopter Museum who continue to maintain the craft in such excellent condition". In the photograph, above right, Elfan ap Rees is on the far left of the group, with John Wood. In the centre is Trevor Egginton who piloted G-LYNX on its record-breaking flight and on the right are Brendan Burr and Benjamin Tooth, two of the Yeovil apprentices who helped to restore G-LYNX to its 1986 configuration. Sadly, only two months after the IMechE presentation, we heard that Trevor Egginton had died, on 23rd November 2014, following a heart attack. A new, revised, 31-page edition went on sale on 1st September 2014. The Guide retains many of the favourite features of earlier editions with an updated, illustrated, fleet list and incorporates a magazine section with interesting articles, many photographs and a floor map to illustrate the position of each aircraft and facility within The Museum. Included are details of 50 engine types held in the collection, many of which are installed in the display aircraft. 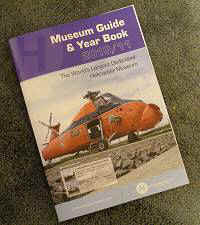 The new Guide is obtainable in the Museum shop or by post for £3.50, plus a £1.50 charge for UK postage and packing. Telephone 01934-635227 Wednesday-Sunday, 10am-4pm. Most credit/debit cards are accepted. 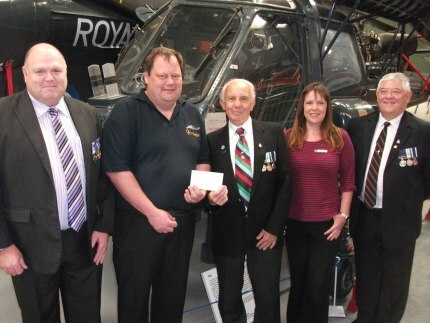 On 12 November 2014 The Volunteer Team at The Helicopter Museum were presented with The Queen's Award for Voluntary Service at an extra special function at The Museum. Longest Serving Volunteer Alan Norris accepted the award from The Lord Lieutenant of Somerset on behalf of all the Museum Volunteers past and present. This is a very prestigious award that celebrates all the hard work performed by The Team over the last 25 years. It was announced, on 2 June 2014, that the Volunteers at The Helicopter Museum are one of nine organisations in the South West to receive the Queen's Award for Volunteer Service this year. The award has equivalent status for volunteer groups as the MBE for individuals. More than 70 volunteers at The Museum carry out a range of activities including aircraft conservation, site & exhibit maintenance, archive development, tour guiding, shop assistance and event support. John Clews was appointed Museum Collections Officer, in March 1912, to succeed Kathryn Tucker in the development of the archives and library, with the archive volunteer team, as well as liaising on displays, exhibitions, events and conservation of the large objects collection. He had a very busy two years in the job, managing to maintain the momentum of the Archive group. Within a few weeks he had also started production of a bi-monthly Museum Newsletter which was aimed exclusively at the staff and volunteers who work at The Museum. His good humour and dedication helped to encourage many of his readers to contribute their knowledge and experiences. Equally important was John's work on the 2013 Arts Council England, assessment returns, which helped to ensure The Museum's National Accredication Status. John left THM in February 2014 to join a legal firm in Exeter. The hard work and professionalism of the Volunteers and Staff of The Museum has been acknowledged by The Arts Council of England with the aviation attraction being awarded a new National Accreditation status. 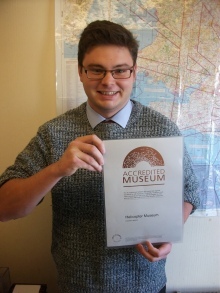 The Accreditation Scheme sets nationally agreed standards for museums in the UK. The Helicopter Museum was originally accredited in 1997 but, since then, the standards have become much more stringent and collections are also required to demonstrate progress. There are currently just under 1800 museums participating in the scheme, demonstrating their commitment to managing collections effectively for the enjoyment and benefit of users. "People's expectations of museums have increased," said Collections Officer John Clews "By passing this new accreditation standard we are considered a museum which is dedicated to best practice in governance, collections care and visitor experience as laid out by the country's leading heritage experts. We are all over the moon to receive this accolade." The Helicopter Museum, which celebrates it's 25th Anniversary in 2014, houses the World's largest collection of rotorcraft including two aircraft previously of the Queen's Flight. Many of it's rare exhibits enjoy top benchmark status on the National Aviation Heritage Register. The latest exhibit to join the collection, the unique Julian CD Wombat gyrocopter from Brecqhou in the Channel Islands, arrived in Weston-super-Mare on 9th July 2013 and went on public display the next day. Developed by former speedway rider Chris Julian in 1990 and built in Cornwall, the Wombat was a progression of the light autogyro technology originated by Igor Bensen in the United States. Julian used his engineering know-how to carry out significant improvements and performed a series of test flights with the aircraft between late 1991 and early 1997 when he was killed in an unrelated gyroglider crash at Kemble airfield. 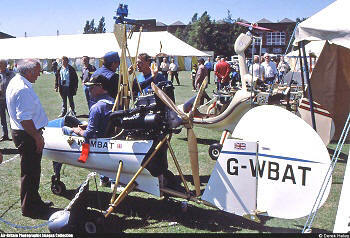 The one-off Wombat and relevant design rights were acquired by Mark Harrisson, a resident of Brecqhou, who eventually abandoned further development and donated the gyrocopter to The Museum. MORE ABOUT THE WOMBAT Thanks to Derek Heeley for his photograph of Chris Julian's Wombat, G-WBAT, at a Cranfield PFA Rally in July 1990. Until early 2014 the Museum Collections Officer published a bi-monthly newsletter, aimed at all staff and volunteers at The Helicopter Museum. The latest newsletter, plus all earlier issues, are available for download, as "Scribd" documents, by clicking on a link in the "Helicollections" blog. The newsletter was emailed and distributed as hard copy within The Museum, with the possibility of additional, personal, emailed copies on request. The last issue, (No.8), was published and distributed on 2nd January 2014 while always available on the above link. Following the departure of editor John Clews, in February 2014, and the delayed appointment of a new Collections Officer, there has been a lengthy interruption to the publication of the Newsletter and Blog. Many will remember the official Museum newsletter "Straight Up". This publication is being revived and, edited by Geoff Russell, is planned to appear quarterly. The Museum received a very special guest on 18th April 2013 when World Speed Record Holder, Trevor Egginton, visited the Museum's lecture theatre to give a unique talk to members of the Empire Test Pilots' School from Boscombe Down. Piloting the Lynx helicopter, registered G-LYNX, he flew a 15km course across the Somerset Levels at 500ft on a calm, hazy, evening back in 1986, setting a new world helicopter speed record of 249.1 mph (400.87 kph) beating the record held by a modified Mil "Hind" helicopter by over 20 mph (32 kph). The record has not been beaten since. John Clews, Museum Collections Officer and Archivist said "We are very proud to have the World Speed Record Helicopter as part of our collection and it was a very special moment to see Trevor climb back aboard and take his rightful place in the pilot's seat". The Helicopter Museum (THM) has appointed Bristol architects Alec French to act as its Stage One lead designer in support of a new Heritage Lottery Fund (HLF) bid. The Practice had successfully participated in earlier HLF funded projects at the Underfall Yard and the SS Great Britain in Bristol and the Clifton Suspension Bridge, as well as being included in design work for Bristol Museum & Art Gallery and the Concorde Trust. THM had already appointed Heritage and Community to support the bid. Subsequent consultation has led to belief that a phased approach, to the project components, should be adopted. The plans include a new two-storey entrance building on the existing site, providing additional display space, conference and enhanced retail and refreshment facilities, with the Westland Lynx helicopter World Speed Record holder placed in a prominent position behind a glass front. 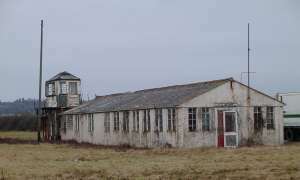 The project could also see the adjacent original 1936 Control Tower building being restored, with heritage displays, and a new hangar built alongside to conserve those aircraft in the collection built in Weston-s-Mare or with a special local connection. Additional visitor parking and other improvements are also proposed. A registered charity since being formed by a group of enthusiasts in 1980, THM holds the world’s largest dedicated collection of helicopters and autogyros dating from the early 1930s to the present day, and is manned and run primarily by volunteers. The Museum currently has opportunities for new volunteer staff to support its retail and other income generating activities, as well as limited vacancies in its engineering and archive/library facilities. Further information on vacancies is available from Lee Mills, Museum Manager, by visiting him at the Helicopter Museum or calling 01934-635227 Weds-Sundays after 10am. 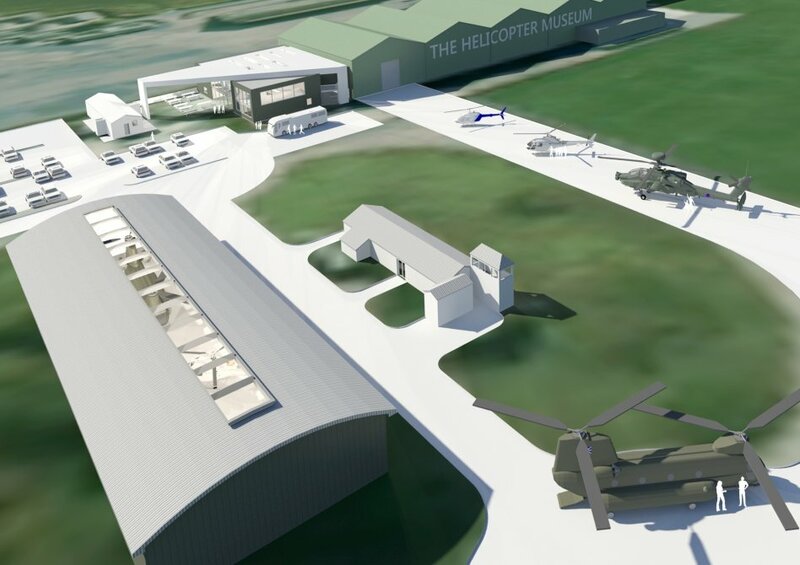 This Architects' graphic summed up early thoughts on future developments and improvements for The Helicopter Museum, some of which may form part of a new Heritage Lottery Fund bid. It shows a proposed new, two-storey, entrance building (top left) on the existing site, adjacent to the green hangars, a refurbished 1936 Control Tower suite (centre) and the proposed new 'Westland' hangar (left foreground). With severe weather in early 2013 it seemed quite apt when a new display opened at The Helicopter Museum, Weston-super-Mare, to mark the 60th Anniversary of The Netherlands Flood Disaster. On 1st February 1953 gale force winds and a high spring tide led to the breaching of coastal defences on both sides of the southern North Sea with over 300 people drowned in England and 1300 in Holland. Responding to this disaster, four WS-51 Dragonfly HR1/HR3 helicopters from 705 Naval Air Squadron at Gosport, including the Dragonfly WG719 (see right), now on public display in The Helicopter Museum, flew to the Royal Netherlands Air Force base at Gilze-Rijen early on 2nd February 1953. Two other helicopters, already there, were a Dutch Navy S-51 and a Sabena Bell 47D-1. Next morning, with all non-essential items removed, the helicopters carried doctors, drugs, 2-way radios and food to the affected areas. Stranded people were then located, winched up and flown to safety, 200 on the first day and a further 534 by the end of 6th February. Five more of 705 Squadron's helicopters arrived on 3rd February and were immediately pressed into service. The nine helicopters despatched to Holland by the Royal Navy were soon joined by two S-51s, G-AJOV and G-AJHW, from British European Airways, piloted by Captain Jock Cameron and First Officer John Crewdson, who were able to rescue 76 people, transport 44 doctors and nurses and drop two tons of medical supplies in their five days of operation. Following requests from the Netherlands authorities the Bristol Aircraft Company arranged for three Sycamore helicopters, VL923, WV794 and G-ALSX (also now in The Helicopter Museum see right) and their crews, including company test pilots 'Sox' Hosegood and Peter Wilson, to leave for Holland on 2nd February. After an overnight stop at Lympne, to repair a serious fuel leak in one machine, they arrived at Woensdrecht, close to the flood zone, by early afternoon. Sabena contributed two additional Bell 47D-1s, OO-UBB & OO-UBC, normally used for inter-city mail deliveries. Also from Belgium came a 'Companie des Proprietaires Reunis' Hiller UH-12A, OO-APR, while the United States Air Force in Germany sent four S-51s and S-55s. "Lights . . . . . Camera . . . . 'Copters !" The Museum came alive with the sounds of "Action!" and "Cut!" 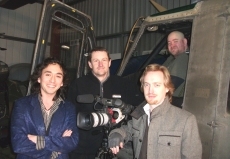 on Friday 4th January 2013 as a film crew recorded scenes for their debut feature using the Bell UH-1 'Huey' from the Museum's collection. The movie, "Shields of Justice" is a comedy written and co-directed by independent film-makers Tom Hutchings and Ben Tallamy. It is a pastiche of classic shows such as "Dragnet" and "Starsky and Hutch", lampooning the fast-paced snap-talk and over-the-top action that we now associate with the genre. The Museum has proved to be an extremely popular filming location of late. 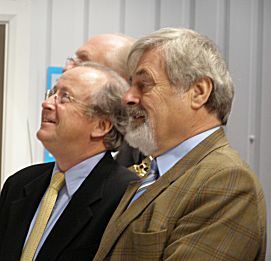 An episode of "The Antiques Road Trip" that was filmed at The Museum in autumn 2012, was screened by the BBC in January 2013. A presentation took place at The Museum, on Sunday 26th August 2012, when Volunteers handed over a cheque for £300.00 to a representative of The South Atlantic Medal Association to bring to an end the Museum's calendar of commemorative events to mark the 30th Anniversary of the Falklands Conflict. A Falklands themed Art Exhibition ran from February until the end of July alongside a factual exhibition about the conflict itself and earlier this Summer a Falklands re-enactment took place on the Museum site as well as a Veterans Signing Event to raise much needed funds for the S.A.M.A Charity. Simon Parks-Lockett, who made the presentation and organised the event said “The South Atlantic Medal Association is an extremely worthwhile cause and it is really wonderful that charities can work together and support each other in these difficult times". The Helicopter Museum is a Registered Charity in its own right and houses the World's largest collection of helicopters including examples of aircraft used in the Falklands Conflict of 1982. Presenting the cheque (above), from left to right, Falklands Veteran Ade Thorne, Museum Volunteer Simon Parks-Lockett, S.A.M.A. Representative John DeBathe, Museum Assistant Manager Sharon Webber and Falklands Veteran Mike Costello in front of The Museum's Westland Wasp Helicopter. 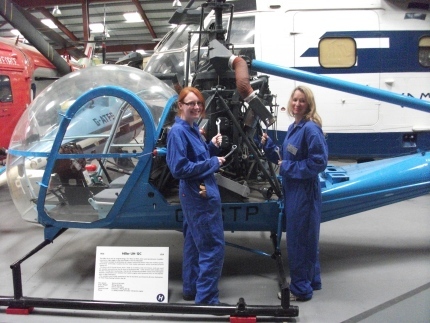 Volunteer engineers at The Helicopter Museum now include a growing number of women keen to get involved in conservation and restoration work on the collection and to learn new skills for future careers in the military or aviation industry. One previous volunteer, Emily Stagg, has already completed her first year of obtaining an aeronautical engineering degree at Brighton University and the museum is currently hosting several new female volunteers including Lauren Shipway, who is studying Aerospace Engineering at Bath University. Other new volunteers, Linda Hamblyn and Azucena Sastre, work alongside the male volunteers, on the collection and in the archives, helping to build up the database of documentation and memorabilia held as part of the collection. Several female volunteers also work in The Museum's gift shop and café, where the friendly working environment has seen new friendships develop and social events organised outside The Museum. Kathryn Tucker, who joined The Museum staff as Collections Officer in 2008, has left to take up a post in the family's property business. A brief farewell ceremony (left) was held on Wednesday 15th March 2012. During her years at The Museum Kathryn set up an archive and library section almost from scratch, recruited, trained and supervised a staff of talented volunteer archivists and implemented the computerised collection management system. Her work in charge of the aircraft conservation teams was equally challenging and well appreciated. Elfan ap Rees, Chairman of Trustees, has announced the following new appointments which took effect in the course of March 2012. Sharon Webber is appointed Full-Time Assistant Manager to assist with the commercial, catering, event hosting and marketing aspects of The Museum. Sharon comes with experience of managing retail and catering outlets as well as having promotional experience. John Clews is appointed Part-Time Collections Officer (3 days per week) to succeed Kathryn Tucker in the development of the archives and library with the archive volunteer team, as well as liaising on displays, exhibitions and events and the conservation of our large objects collection. Rod Holloway is appointed Part-Time Engineering Manager (3 days per week) in charge of aircraft restoration and movements with the aircraft volunteer teams, as well as liaising on displays, events and the conservation of The Museum's large objects collection. On 12th February 2012 the international helicopter pilot social group, Twirly Birds, presented its Les Morris Award for 2012 to Elfan ap Rees. Elfan is well known as an aviation historian, journalist, author and pilot in addition to being Founder and Chairman of Trustees at The Helicopter Museum. Les Morris was Igor Sikorsky's Chief Test Pilot for the VS-300, YR-4A and XR-4 helicopters from 1941 until 1944 so the Les Morris Award, reserved for members who have made an exemplary contribution to the helicopter community over their lifetime, also signifies the pioneering spirit of Twirly Birds. 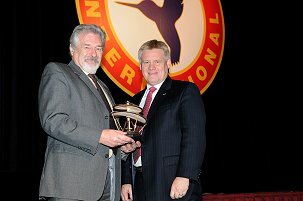 The Award was presented during the 2012 Twirly Bird annual meeting, held at Heli-Expo in Dallas, Texas. 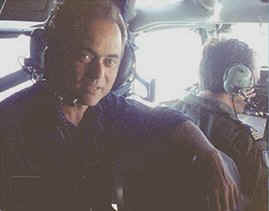 A London-based film crew took over The Helicopter Museum in Weston-super-Mare, in early January 2012, to film a brand new episode of hit National Geographic TV Show, 'Seconds from Disaster'. The episode entitled 'Black Hawk Down' recreated the near disastrous American military mission into Mogadishu, capital of Somalia, on 3rd October 1993, which was made famous by director Ridley Scott's 2001 Oscar winning movie of the same name. Sections of the Museum's hangars were transformed, by a set design team, to recreate the US Task Force Ranger barracks and Ops Centre, while a helicopter from the museum's collection was modified to resemble a Black Hawk before being moved out onto the Museum's Helipad ready for the 15 hour shoot. Museum Volunteer Rod Holloway acted as the Aviation Technical Advisor for the filming. "I had to instruct the actors playing the flight crew about preparing the aircraft for take off, the in-flight controls and emergency crash landing procedures" said Rod, "The scenes had to look extremely realistic and as accurate as possible. 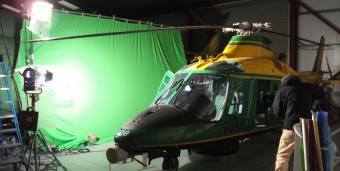 A giant Green Screen was erected behind the helicopter and a wind machine blasted the poor actors in the back with sand to make it appear as though they were actually landing in Mogadishu." 'Seconds from Disaster' is an American documentary television series that investigates historically relevant man-made and natural disasters. Each episode aims to explain a single incident by analysing the causes and circumstances that ultimately effected the disaster. The series uses re-enactments, interviews, testimonies, and CGI to analyse the sequence of events, second-by-second, for the audience. Members of the Friends played a major role in publicising The Museum for Helitech 2011 at Duxford, in September. £600.00 worth of merchandise, kits, souvenirs etc., was sold. 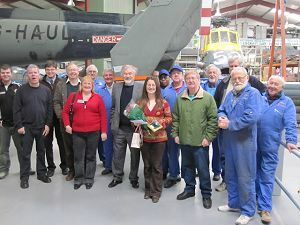 The Friends Annual General Meeting for 2011, open to all Members, was held at The Museum from 11.00 am on Saturday 10th December 2011. The Committee apologised for late changes to a previously announced date for this meeting. The Museum, among many similar organisations, benefited greatly from the series of excellent technical training courses provided, over several years up to 2010, by lecturers from the National Aviation Skills Initiative (NAHSI), supported by the Heritage Lottery Fund (HLF), the Imperial War Museum, Duxford (IWM) and the British Aviation Preservation Council (BAPC). Unfortunately NAHSI's funding, largely from HLF, ceased in 2010 and has not been renewed or replaced. The South Western Federation of Museums and Art Galleries, more often referred to as the "SW Fed" or even "The Fed", has organised training days, around the South West of England, on the subject of "The Care of Metals". 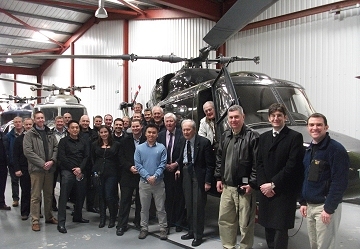 The 1-day programme consisting of a mixture of lectures and practical sessions, was presented at The Helicopter Museum by two conservation experts from Exeter, on Thursday 20th October 2011. Several THM conservation volunteers took part. On Wednesday 19th October 2011 Nick Pearce-Smith, Customer Support Manager at the MODES Users Association, conducted a training day, at The Museum, which covered the use of ModesXML, the Collections Management System which is used by THM. He introduced 'Modes Complete' which had been launched on 28th September 2011 as a free upgrade to ModesXML. Among other enhancements the upgrade, expected to arrive in November 2011, will provide automatic session backup, drag-and-drop multimedia attachment and spell-checking (surely not needed by our Collections staff ?). Five Helicopter Museum volunteer archivists and the Museum Collections Officer attended. A very unusual donation has been made to The Helicopter Museum by UK house builder, Barratt Developments PLC, which in the past featured helicopters in its television advertising to sell new homes nationwide. The first UK house builder to use TV advertising, Barratt Homes commissioned the commercials in the 1970s, initially using a Bell JetRanger and later an Agusta A109A to advertise their low-cost housing. The promotion, featuring actor Patrick Allen (see below), made the company nationally famous by the early 1980s and helped it to become the UK's largest house builder. Although the TV commercials had stopped by the mid-1980s the iconic helicopter image remained and continued to feature in some of the company's local housing promotions until recently. 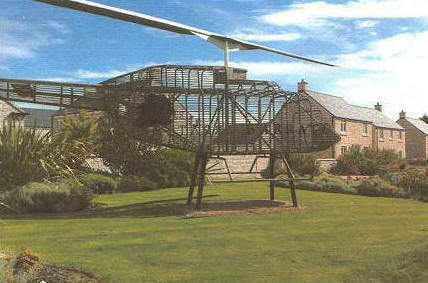 This included use of a helicopter sculpture at some of the company's development sites in the South West of England. 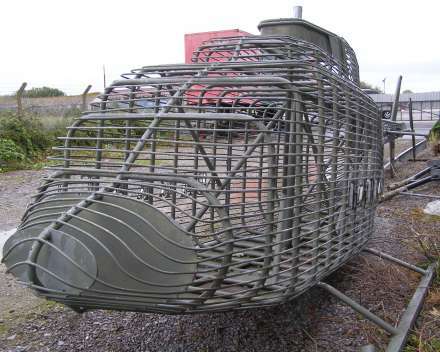 It is this sculpture, essentially a full-size skeletal JetRanger, which has been kindly donated to The Museum following completion of a housing development in the village of Paulton, in Somerset. The Museum, a registered charity, now plans to erect the sculpture as part of a future redevelopment on the main road site frontage. Top right is the sculpture on a pedestal at Paulton, prior to transportation to Weston-super-Mare and bottom right at The Museum soon after delivery in September 2011. The actor Patrick Allen was born in Nyasaland (now Malawi) in March 1927. He specialised in authoritarian film and TV characters but, late in his career, he re-recorded a few lines from his 1964 voiceovers for the "Protect & Survive" civil defence public information campaign, for the 'Frankie goes to Hollywood' anti-nuclear war anthem "Two Tribes". He died in July 2006 aged 79, survived by his wife, actress Sarah Lawson whom he married in 1960, and their two sons. 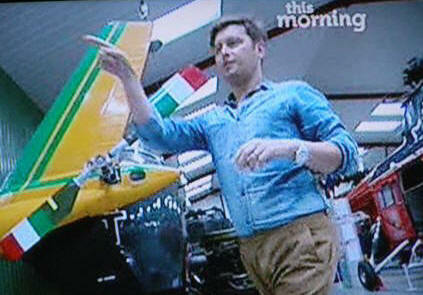 On Wednesday afternoon 10th August 2011 Television Celebrity Brian Dowling was recording a feature for ITV's 'This Morning' at The Helicopter Museum. After sequences on the Museum's Helipad (right), Brian and his camera crew took off in a Jet Ranger helicopter to film Weston-super-Mare from the air. 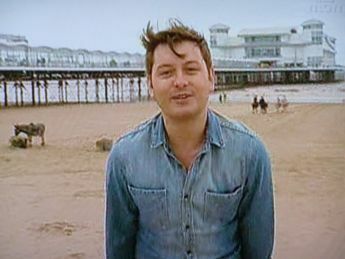 A live outside broadcast, hosted by Brian Dowling from the beach at Weston-super-Mare and including the scenes shot at the Museum, was seen nationwide on Thursday morning, 11th August 2011. 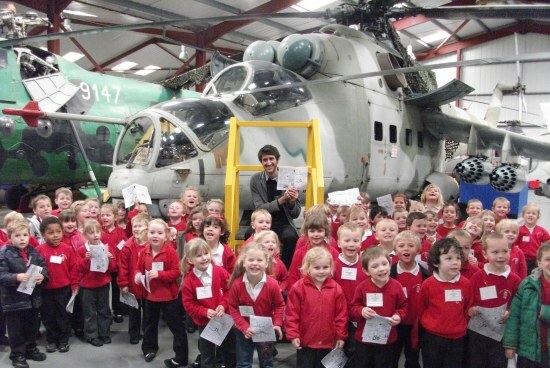 It was an exciting day at The Helicopter Museum as the aviation attraction and local charity launched the first edition of it's new children's comic. 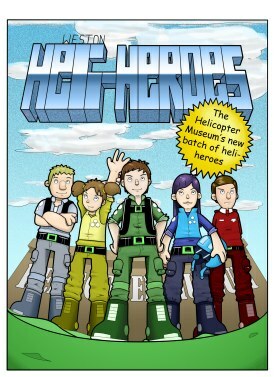 "Weston Heli-Heroes" is the brain child of Museum Educational Assistant, Thomas Kousiounis who not only wrote the story but designed all the artwork and drafted the comic from scratch. Thomas, who is working at the Museum and is employed by Scout Enterprises (Western) Ltd through the Future Jobs Fund programme, aims to produce a bi-monthly publication that is free for any children visiting the museum. A free digital copy is also being launched on the Museum's website for local schools, educational groups to download. “I wanted to engage the children's imaginations with a compelling story that would bring the helicopters in the Museum to life” Thomas explained. Museum Manager Lee Mills said "A lot of hard work has gone into making our Museum more child friendly over the last couple of years and school bookings are continually increasing. We wanted to produce something for the visiting children to take away that was not only a good read but educational as well. Thomas had the perfect answer. to 'chroma key' into previously filmed location material. Members, Volunteers and Museum staff, provided with appropriate uniforms and headgear, were invited to play the roles of SAR pilots, flight crews or American Air Force personnel, in each scene. It is rumoured that some even had speaking parts to play. The new season of twenty "I Shouldn't be Alive" programmes was expected to be screened in the UK, the United States, New Zealand and Australia, by Channel 4 and The Discovery Channel in 2011. Agusta A109A MkII, MM81205, GdiF-128, c/n 7336, previously in service with the Italian Guardia di Finanza, was delivered to The Helicopter Museum on a curtain side trailer, on 6th October 2010. It arrived complete and, although the main rotor blades and the horizontal stabilisers had been removed for the journey, they were soon re-fitted by the conservation volunteers, after unloading. 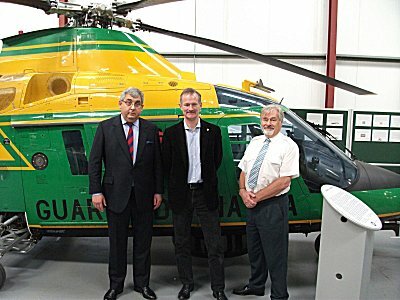 Two days later the helicopter was unveiled by UK Tourism & Heritage Minister, John Penrose MP, and officially handed over to The Museum by Graham Cole, Agusta Westland's Managing Director, during a ceremony on 8th October 2010 (right). GdiF-128, the 6th A109GdiF delivered to the Guardia di Finanza, in 1986, was declared surplus to requirements in June 1910 and withdrawn from use. Before shipment to the UK it was returned to AgustaWestland for temporary storage at their Frosinone plant, between Rome and Naples. In the photograph are (left to right) Graham Cole, John Penrose and Elfan ap Rees. The acquisition by The Helicopter Museum was supported personally by the Chief Executive Officer of manufacturer AgustaWestland, Giuseppe Orsi. The company also sponsored shipment of the helicopter from Italy. More Photographs. July 2010 photos are on the Helidays 2010 Gallery page. 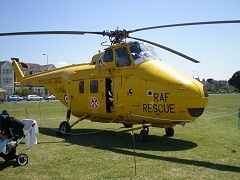 There was no International Helidays on Weston-super-Mare's Beach Lawns in 2011, mainly due to ever-increasing costs with decreasing revenue and funding. Instead a smaller scale Mini-Helidays 2011 Weekend was held at The Museum's Heliport, on Saturday 23rd and Sunday 24th July 2011, with the Czech Air Force offering a Mi-171Sh 'Hip' and a Mi-35 'Hind-E' while the French Air Force contributed an AS.555 'Fennec'. Another success! Members of many different clubs, "virtual airlines" and companies with trade stands brought their computers, software, instrument panels and controls to The Helicopter Museum on Saturday 15th and Sunday 16th May 2010 for the second annual Flight Simulator Convention. Again organised by Museum Volunteer and Friends Member Simon Tolley, with valuable and essential support from Museum General Manager, Lee Mills, the show attracted over 1400 visitors, a 50% increase over the 2009 figure. 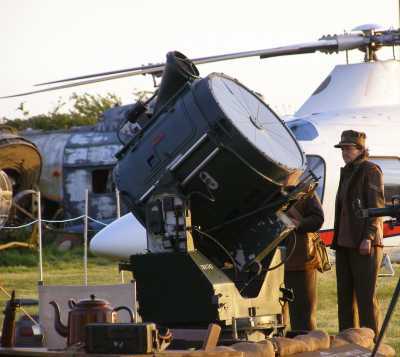 New and added attractions this year included searchlights, anti-aircraft guns and a 32 Squadron Agusta A109E Power. As in 2009, all profits from the show will be donated to charities, including The Helicopter Museum and the three local Air Ambulances. The organisers recognised the hard work done by the dozens of Volunteers, including Friends Members, who had worked tirelessly, during the Show, after the show and in the preceding weeks, to make everything happen according to plan. Special thanks went to staff in the Museum cafe, who served 50% more customers, each day, than last year. The Flight Simulator Convention has now become established as an annual event at The Helicopter Museum in Weston-super-Mare and the third show took place on 14th and 15th May 2011 with even more exhibits and trade stands than in previous years. Members and Volunteers will be sorry to hear that Roger Dudley died on 14th March 2010, after a three year battle with cancer. Roger became an apprentice with the Bristol Aeroplane Company in 1955 and subsequently worked for Westland Helicopters in Weston-super-Mare and Yeovil. He learned to fly in the 1960s, obtaining his PPL and gliding Silver 'C'. Following retirement, already having close ties with The Museum, he went to work there as a Volunteer and joined the Friends as one of their first Members. One of the jobs which he tackled, as a conservation Volunteer, was the repair and refurbishment of three plywood covered main rotor blades, with spruce and ply ribs, from an early Bristol Sycamore. The skill and quality of his work was judged to be exceptional. One of Roger's many enthusiasms was the history of aviation in all its aspects, though with a natural emphasis on rotorcraft. 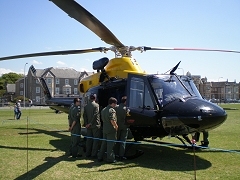 In 2006 The Helicopter Museum mounted an exhibition which dealt with the seventy years history of Weston-super-Mare airport. Opened in 1936 it was soon, for a brief period, the busiest civil airfield in the UK. Roger played a major part in the compilation of material and the supply of photographs for the show. He also interviewed many local residents who had memories of the airport (see also "Roger's Research" further down this page). Following the exhibition Roger started serious work on writing his long-planned book about the hundred year aviation history of the local area. Written with co-author Ted Johnson, the book, "Weston-super-Mare and the Aeroplane", was published, by Amberley, in February 2010, less than a month before his death, and is available from the Helicopter Museum shop. 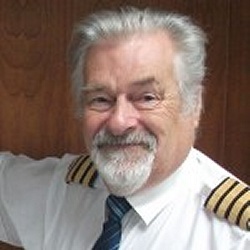 Roger was always a generous fount of knowledge and expertise on anything connected with aviation and would happily 'go the extra mile' to help. He will be greatly missed by all who knew him. 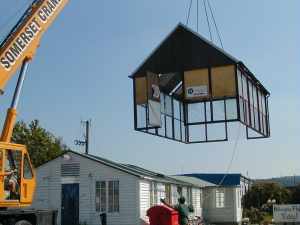 The building of a single-storey 200 sq.m extension to the Conservation Hangar, designed to house an Archive and a Film Theatre/Classroom, was started in early 2008. The Theatre was completed and fitted out in June 2008. Comprehensive screen and projection facilities followed two months later. Construction was financed from a Heritage Lottery Fund grant. 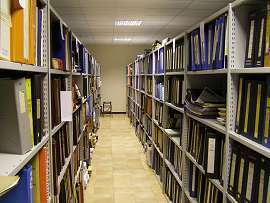 Storage units were installed in the new Archive Store and Library area and the newly-appointed Collections Officer, Kathryn Sherrington, started work at The Museum on 3rd September 2008. Much of the existing Archive Library had been housed in a semi-derelict caravan, in cramped, cold and damp conditions, so that the first priority was to sort the documents, books and manuals before installing them, on the new shelving, in the air-conditioned archive store allocated to them. 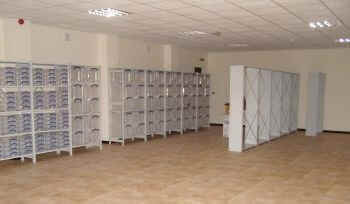 Other items, from a variety of sites, started to arrive and were given places in the new storage areas. 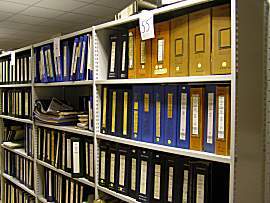 There was an obvious need for a new labelling, numbering and retrieval system which would cater for all the documents, manuals, books, magazines, brochures, artefacts, photographic material, digital media etc which The Museum has collected over many years and those which would continue to be acquired. The need for a computerised system, to replace previous fragmented paper records, was fairly obvious and was essential if The Museum is to retain its accredited status. MODES was chosen as The Museum's Collections Management System. Its software fulfilled the Museums, Libraries and Archives Council (MLA) recommendations and it is one of the most popular systems among UK professionals. Kathryn Sherrington described the implementation process. "We have a database! A very basic one at the moment but it is a big deal for somewhere that has previously had nothing. MODES has very powerful functions that I intend to utilise. The process of getting ready to use the database has been a long and labour intensive one, reviewing all of our existing collection documentation, ironing out problems and defining a system which is now documented in a user friendly 'how to' manual." She continued, "I have recruited a team of volunteers to help put this system into place. They are all working hard to get through the backlog of material that has built up over the years, but we are keen to receive new material too!" "Our archives are already being used regularly for research, although this is something I want to encourage further. The success of this depends on us collecting and recording information in a way that maximises accessibility, which is why I'm always keen to hear from anyone who wants to help us create more sophisticated records". 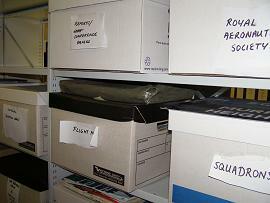 Members of the Friends, and others, are encouraged to donate documents, photographs and artefacts to the Museum Archive. Two Members were among the first five Archive Volunteers to be recruited. A Summer Exhibition, held at The Helicopter Museum in 2011, was designed to provide visitors with behind-the-scenes insights into how the Collections Department catalogues and cares for the extensive and increasingly varied range of objects in its charge and to show how The Museum is working to become the home of one of the largest rotorcraft archives in the world. The displays featured some of the items of local interest and of historic significance, which have been donated to The Museum over many years, while detailing the painstaking processes of managing and conserving the collection. 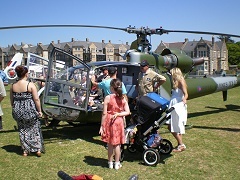 The exhibition was organised by Kathryn Sherrington, Helicopter Museum Collections Officer and Somerset Representative at the South West Federation of Museums and Art Galleries. For the last five years Geoff Russell, a Trustee of The Museum and a Member of the Friends, has played a major role in the compilation and production of the official Museum Guidebook. A new, revised, 30-page edition went on sale in 2010 with further revisions incorporated in 2011. The Guide retains many of the favourite features of earlier editions with an updated, illustrated, fleet list and incorporates a new expanded magazine section with interesting articles and many photographs. Geoff includes details of 44 of the engines held in The Museum's collection, many of which are installed in the display aircraft. The new Guide & Year Book is obtainable in the Museum shop or by post for £3.50, plus a £1.00 charge for UK postage and packing. Telephone 01934-635227. Most credit/debit cards are accepted. Mike Kurth, MD of Boeing Defence UK, visited The Museum, on Friday 20th November 2009, to meet staff and volunteers before unveiling a new exhibit. 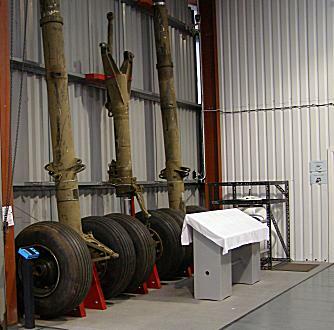 The exhibit includes landing gear components from the largest helicopter ever built in the West, the Boeing Heavy Lift Helicopter (HLH) XCH-62, development of which was abandoned in the late 1980s. The sole example was broken up at Fort Rucker, Alabama, in 2005. Full story with pictures on another page. Following graduation, Kurth served for 24 years in the US Marine Corps, flying more than 5000 hours in more than 30 types of fixed and rotary wing aircraft and retiring as a Colonel. In 1996 he took a job, initially as a consultant, with the McDonnell Douglas Helicopter Systems division, working on the Apache. 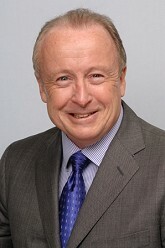 His career with Boeing began in 1997 after the merger with McDonnell Douglas. In 1999 Kurth moved to Boeing's Space and Communications Group, soon becoming vice president of Business Development. He took up his current appointment, in London, in January 2008. More than 200 local residents and members joined the Mayor of Weston-super-Mare and the Museum Trustees at The Museum on 7th April 2009 to celebrate the 20th Anniversary of the Collection's official opening to the public, with a Concert and Hangar Dance. During a buffet interval the Mayor, Cllr.Mike Kellaway-Marriot, spoke of the growth and achievements of The Museum, which has expanded seven times since it's origin, and introduced the Founder, Elfan Ap Rees, who began the Collection in 1969 with the acquisition of a Bristol Sycamore helicopter. Before the guests danced the night away to the swinging sounds of the Fifties, provided by the RAFA Dance Band, Elfan thanked the Volunteers and Supporters who had helped turn his ideas into reality. with a 'Night at The Museum'. It was a success. Members of many different clubs, "virtual airlines" and companies with trade stands brought their computers, software, instrument panels and controls to The Helicopter Museum on Saturday 16th and Sunday 17th May 2009 for the first annual Flight Simulator Convention. The event, ably organised by Museum Volunteer Simon Tolley, was open to the public who had a chance to see how an aircraft flies and handles, using the latest simulators. At 6pm, on the Saturday evening, simulators were switched into night flying mode as part of the Europe-wide "Museums at Night" weekend. 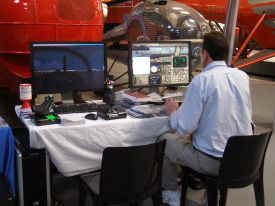 Around 902 paying customers came though the doors over the weekend, to see at least 30 simulators. A much smaller Flight Simulator Show had been held at The Museum before, in April 2002. Attendances were poor at this first event, probably due to lack of sufficient suitable advance publicity, and traders were not willing to support a repeat. Seven years later a well-targeted and large scale campaign was launched, well in advance, aimed at enthusiastic simulator users and traders but not forgetting that the event had to be enjoyable and interesting for other visitors. Flights round the bay, in a REAL Bell 206B Jet Ranger, were available on both days. Great Western Air Ambulance's Bo105DBS-4, G-NDAA (right) and Dorset and Somerset Air Ambulance EC.135T2, G-DORS, visited on both days. 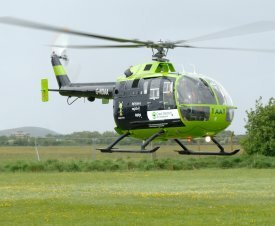 G-WCAO the EC.135T2 from Avon & Gloucestershire Police arrived on Sunday as did Castle Air's Agusta A.109A, G-PBEK. Visitors from around the globe, including Poland, Malaysia, South Africa, the USA, India and Latvia were reported by the organisers, who have been invited, by The Museum, to use the venue again next year. Most of the traders and exhibitors praised the smooth and efficient organisation and expressed a wish to return next time. Special praise went to Lee Mills, Museum General Manager, for his hard work in co-operation with the Show Organiser, Simon Tolley. Flight simulator enthusiast Alex Jefferies who attended the event said “I have been to lots of similar conventions in the UK but never to any on this scale. The Museum was a marvellous setting and the atmosphere here was electric, people could not believe that they could have a go and test fly all the different simulators for free." All profits from the show were donated to charities, including The Helicopter Museum and the local Air Ambulances. The organisers recognised the hard work done by the dozens of Volunteers, including Friends Members, who had worked tirelessly, during the Show and in the preceding weeks, to make everything happen according to plan. Special thanks went to staff in the Museum cafe, who served many more customers, each day, than ever before. Members of The Friends were especially glad to see John and Barbara Pearson, the Friends' new Secretary and Bulletin Editors, running the traditional Friends' fundraising book stall. 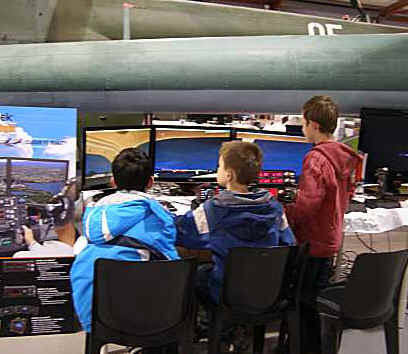 It is intended that the Show should be an annual event at The Museum and the second Flight Simulator Convention duly took place on 15th and 16th May 2010. A film crew from TV’s "The Gadget Show" took over the grounds of Weston-super-Mare’s Helicopter Museum, on 26th March 2009, to film an episode of the popular Channel Five programme. For the last test of the day, a pyrotechnic crew was brought in to perform a series of staged explosions on the Museum's helipad and both cameras were blown up in a final experiment to test how indestructible they really were. Volunteer Simon added “With all the flames and smoke, the final shoot was really impressive and the explosions should look quite dramatic on TV.” No stranger to gadgets himself, Simon was the organiser of the Flight Simulator Event that took place at the Helicopter Museum on 16th and 17th May. ‘The Gadget Show’ episode, which includes sequences filmed at The Museum, was first broadcast by Channel 5 on 11th May 2009. Members of The Friends will know that, for many years, The Helicopter Museum has offered extra hospitality in the form of birthday parties, special meals with guided tours for groups and private evening visits. Film and television programme makers have always been encouraged to take advantage of the unique facilities and expertise which The Museum can offer. 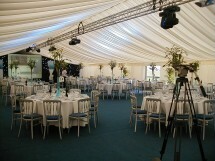 Back in 2005 The Museum provided facilities for an Airbus Staff Awards function when, although Airbus brought along much of their own catering, furnishing, staffing and a large marquee (right), the true potential of The Museum, as an attractive venue for corporate hospitality, was realised. Guests were shown around the Museum exhibits, before the function, by the many THM Volunteers and Friends, who helped to make the event a big success. In September 2006 the Morris Minor Owners Club held their Annual Rally at the Museum Heliport with 60 Morris Minor cars attending. In April 2007 the South-West section of the UK Mercedes Club held their Annual Rally at The Museum where their members were given a special tour and coffee reception while other visitors saw a display of Mercedes cars. Later in 2007, The Museum hosted its first Wedding Reception. Among subsequent corporate hospitality enterprises, organised by Museum General Manager Lee Mills, have been an Anniversary Reception for 150 Royal Air Force Association members, war veterans and local dignitaries, which took place on Friday 12th September 2008, with performances by the RAFA Concert Band, followed, on Thursday 18th September, by a ticket-only launch party for Alpha Courses, with a talk by Bristol City's goalkeeper, Adriano Basso. Similar events at The Museum included hosting of the 2008 RAFA Annual Seminar on Thursday 20th November 2008, with The Museum catering staff providing a buffet for 70 or more guests, and a Christmas Party for the local Beavers in December 2008. On December 14th 2008 The Museum hosted West Country Fairs' 'Crafts for Christmas' event. This attracted nearly 500 visitors who enjoyed the many activities and seasonal stalls which had been organised. Especially popular were the two concert performances by the 'Lyrica' ensemble of professional female singers and the delicious lunches in the Museum café, which had its busiest day ever. 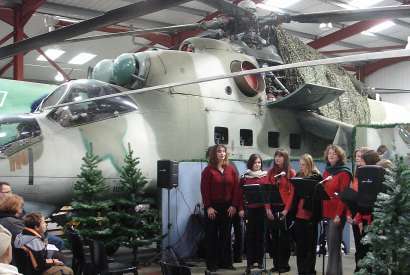 We thank Lee Mills for the photo (left) showing Lyrica singing carols beside the Mi-24, 'Hind'. 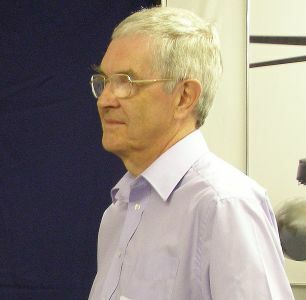 The American Helicopter Society (AHS) has presented Elfan ap Rees, founder of The Museum and Chairman of its Trustees, with their prestigious John J. Schneider Historical Achievement Award for 2008. This Annual Award, presented (left) this year in Montreal, by AHS Chairman and Boeing Vice President Phil Dunford, recognises distinguished achievement of an individual in encouraging appreciation of, and enhancing access to, the history and legacy of vertical flight aircraft. The Award, established in 2003 in memory of vertical flight historian John J. Schneider, is a replica of Leonardo da Vinci's 1483 helicopter design. After the presentation, on 30th April 2008, Capt. ap Rees said that, while personally flattered to have been honoured, he hoped that the Award would benefit The Helicopter Museum by raising its profile and ensuring its recognition as a unique and significant collection. 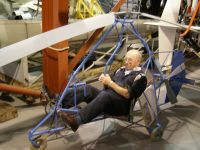 Friends Member Ray Caple (seen below with the Watkinson Cyclogyroplane), combined his activities as a restoration volunteer with frequent duties as a Tour Guide for the Museum. In September 2007 he noticed a visitor looking at the Museum's bust of Jacob Shapiro who, as Chief Technical Officer of the Cierva Autogiro Company, took a leading part in the development of a number of early helicopter prototypes in the 1940s, 50s and 60s. 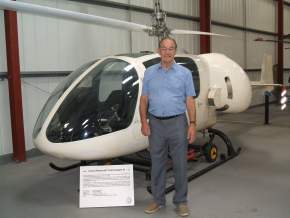 It emerged that the visitor, Peter Barton from Lutterworth, had worked with Shapiro on the design of the coaxial rotor system for the 1969 experimental 5-seat Cierva/Rotorcraft Grasshopper helicopter, the final prototype of which is on display at the Museum. Peter Barton seen, above right, beside the Grasshopper III, had previously been unaware of the machine's preservation. In 1959 Henry Kremer offered a prize of £50,000 for the first human powered aircraft to fly a 1 mile, figure-of-eight course. Three machines were built by Herbert Watkinson, of Bexhill, England, in attempts to win the prize. The third machine, the CG-4, was not complete when Mr. Watkinson died in 1977. The pedal-powered CG-4 was donated to The Museum in 1979 with documentation and photographs. In 2006, restoration volunteer and Friends Member, Ray Caple, repaired, restored and repainted the machine. The first Cyclogyroplane, the CG-3/1, was built in 1961 and flew free in 1962. An improved version, the CG-3/3, flew 175 yards at RAF Tangmere in 1963 but could not be manoeuvered sufficiently. It was donated to the Shuttleworth Collection in 1970 but was subsequently damaged and scrapped. Watkinson began work on the CG-4 in 1976 and was near completion when, in April 1977, his wife died suddenly following an accident. Although he attempted to continue work on the CG-4, Herbert Watkinson died six months later. The first Kremer Prize was won by Paul MacCready's 'Gossamer Condor', piloted by Bryan Allen, in August 1977. The CG-4 'Cyclogyroplane' went back on display, at The Museum, in September 2006. Sadly, Ray Caple died in October 2009. The Helicopter Museum is sited on the southeast corner of the original Weston Airport, which was opened by the Deputy Lord Mayor of Cardiff on 25 June 1936. The airport became a hub for regular services to Cardiff, Exeter and Birmingham. It was soon, unbelievably, the busiest civil airfield in the UK, for a few months and the runway remained in use, for a wide variety of civil and military aircraft, into the 1990s. The 1930s terminal buildings were demolished some time ago, though fragments remain. 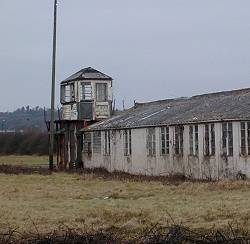 Still standing (left), close to The Museum, are the 1940s dispersal rooms and the 1937 flying control tower, topped by a 1920s cab drivers shelter. These buildings have been used by the Museum, more recently, as storage areas. The Museum decided to celebrate this 70th anniversary with a special Exhibition and made contact with many local residents, former Western Airways employees and ex-servicemen, who had memories and, very often, old photographs of the airfield. A Museum restoration volunteer, aviation historian and Friends Member, Roger Dudley, contributed much of his own research material to The Weston Airfield Exhibition at The Museum. He also met many residents in the area, to record their memories and to make copies of their old photographs. The Exhibition was officially opened by the Deputy Lord Mayor of Cardiff, Kate Lloyd, on Sunday 25th June 2006, exactly seventy years after her predecessor opened Weston Airfield. It continued until 17th September 2006, having been extended by two weeks because of public interest. 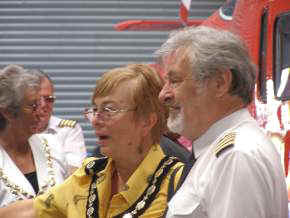 The Deputy Lord Mayor of Cardiff, Kathryn Lloyd, (centre, with Elfan ap Rees) opened The Museum's Weston Airfield Exhibition on Sunday 25th June 2006. 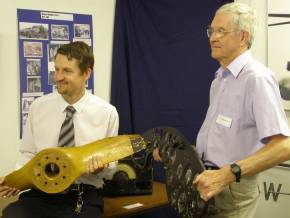 Lee Mills (left), Museum Operations Manager, and Roger Dudley face the press cameras after spending many weeks assembling words, pictures and artefacts for the displays. Back in 2004 Peter Pigott (below left), a Canadian aviation author with twelve books to his credit, contacted The Friends to tell us that he was researching all the cars, aircraft, trains and ships that the British Royal Family has used at home and abroad. His intention was to write a book about Royal Transport, for publication before Christmas 2005. He had seen this Friends website and asked us to allow him the use of any suitable photographs of the ex-Queen's Flight Whirlwind and Wessex (below right) which are on display in The Helicopter Museum. The Friends supplied Peter with more than fifty photos, suggested reference material and put him in touch with several past crew members of the Queen's Flight. We have recently received, from Peter, a copy of his excellent book, which generously acknowledges the help given by The Museum and individual Friends. The book has generated some valuable publicity for The Museum and The Friends. We were glad to welcome Peter to The Museum on 30th June 2005 and to provide him with a Friends membership application form. The book, "Royal Transport", was published by Dundurn Press, in Canada, in October 2005 and went on sale in the UK, on 6th March 2006. The Helicopter Museum at Weston-super-Mare in Somerset has put on display an early turboshaft engine, whose design dates from the 1950's. The engine, a Napier Gazelle, is one of several held by the Museum, and has recently been restored, for static display, by volunteers at the Rolls-Royce Heritage Trust at Patchway, Bristol. It was delivered to the Museum on 26th January 2012 and can be seen at the rear end of the Belvedere XG462 nose section in the Main Display Hangar. Kathryn Tucker, the Helicopter Museum Collections Officer said, after the first arrival, "We are really impressed by the standard of work carried out by the Rolls-Royce Trust volunteers. The engine now looks like new and is an interesting addition to our displays." The first British-designed turboshaft engine to enter service, the 1600shp Gazelle was installed from the late 1950's in the Bristol Belvedere, built at Weston-super-Mare, and the early Westland Wessex helicopters, but was rapidly succeeded by lighter and smaller engines developed to provide similar power. One of these, the Rolls-Royce Gnome replaced the Gazelle in the Wessex, being small enough for two to be installed side by side in the same area as the previous power plant. Nevertheless the Gazelle remained in service with the Belvedere until 1969 and with the Wessex HAS.3 until the mid 1980's.The Rolls-Royce trust has since restored and, on 21st June 2012 delivered, two more Gazelles for the Museum, which plans to install them, in due course, in the collection's prototype Belvedere, XG452. The engineering firm D.Napier & Son was founded in 1808 and started producing motor cars in 1900. During the 1914-18 war they built 600 aircraft, RE.7s, RE.8s and Sopwith Snipes under contract, at their Acton factory. In 1916 they designed their first aircraft engine, the 'Lion', which was used in the 1920s to win the World Land Speed Record in Malcolm Campbell's 'Bluebird' and Henry Seagrave's 'Golden Arrow'. Napier was taken over by English Electric in 1942 and, in 1945, they designed the complex but reliable 'Deltic' diesel engines for the Royal Navy's patrol and torpedo boats. 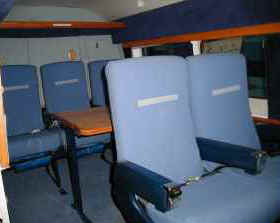 It was developed as a locomotive engine in the 1950s, powering British Rail's Class 55s. Following some post-war success with the 'Gazelle' and 'Eland' turboshaft engines Napier was acquired by Rolls-Royce in 1962 but, after a management buyout in 2008, became an independent company and a leading supplier of axial turbochargers. 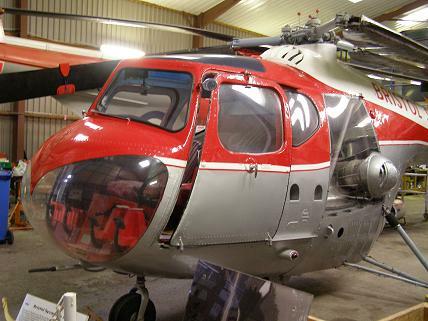 In August 2011 The Helicopter Museum completed a £387,000 project, under a Heritage Lottery Fund (HLF) programme, to upgrade its conservation and education facilities while introducing new skills training. The four year programme has seen the thermal insulation of the Main Hangar, the construction and fitting out of a humidity-controlled Library and Archive centre, with adjacent film/lecture theatre, the introduction of a new Interactive Area and the provision of additional film screen displays. The Conservation Hangar has benefited from the introduction of new equipment and skills training for the Volunteers. The 2007 HLF grant of £290,500 also covered the employment of an Education Officer to set up an outreach programme for Schools and groups in the area, with training for Tour Guides and other Volunteers. There were 40 Educational Visits to the Museum in 2010 and a further 28 Visits are already booked in 2011. Matching funding for the education projects came from AgustaWestland in the form of technical assistance and surplus equipment to create the new Interactive Area while Museum Volunteers contributed more than 3500 man-hours to fit out the archive and manufacture special pieces of outreach equipment including a mobile rotorcraft exhibit. Chairman of The Helicopter Museum Trustees, Elfan Ap Rees said "This has been a complex project for us as a voluntary group, dealing with many different suppliers and entities, and managing it ourselves has undoubtedly been a challenge. However the HLF has been extremely helpful and understanding as the work progressed to completion and we are very grateful for their advice and help". "As a result of the programme the Museum now has even more to offer visitors, with continuous film shows every day, new displays, a helicopter flight simulator and other interactive material for children and adults of all ages." The Heritage Lottery Fund contribution was unveiled by the Chairman of Trustees, Elfan Ap Rees on 3rd August 2011. Spare Sycamore Blades go 'Up for Grabs'. On 20th August 2008 The Museum announced that the Trustees had appointed Kathryn Sherrington BA(Hons) to be The Museum's Collections Officer, a new post designed to develop the archive and library. Additionally she has taken on the management of the team of Volunteers who work on aircraft restoration. The Museum announced, on 28th March 2007, that it had been awarded a £290,500 grant, by the Heritage Lottery Fund, towards new education, skills training and conservation facilities. 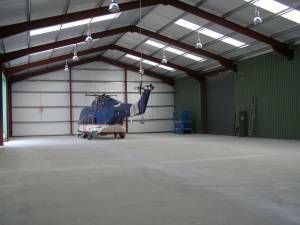 The Helicopter Museum announced, in November 2006, that work was under way to extend the existing Display Hangars in a westerly direction. Museum Volunteers had cleared the site of sundry aircraft and the old Coles crane, allowing excavation for foundations to begin at the end of October 2006. 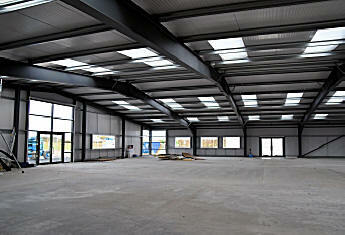 The first phase followed the pattern of the existing hangars, providing a 670sq.m increase in floor area. 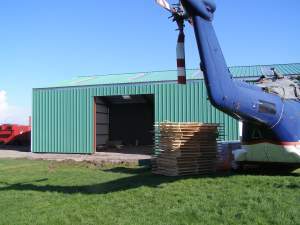 The newly-created undercover space was used, initially, for storage of some of the helicopters which had been out in the open air and to house three additional helicopters, which were acquired in 2007. Additional conservation activity was also started, notably on the Wessex HAS.3, XM328 and, in 2008, the Wessex 60, G-AVNE. It is hoped that, eventually, all skills training, most of the restoration work and some of the recently introduced regular maintenance and inspection, will be transferred to this new "west end" hangar bay. The cost of the basic new building has been met from The Museum's own funds, to which the Friends make a significant contribution. In March 2007 the Heritage Lottery Fund awarded The Museum a substantial grant towards fitting out the interior for training and transferring many of the existing conservation and engineering facilities. Although building started in October 2006, there was a short delay before steel was delivered and started to be erected after Christmas. Good weather then allowed work to proceed rapidly and the structure was completed in April 2007 (right). On 20th July 2007 the new Engineering Hangar was officially opened by His Royal Highness the Duke of Edinburgh, who was accompanied by Her Majesty the Queen. 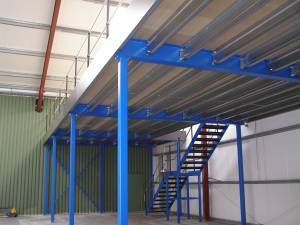 Two months later a small mezzanine floor was installed, at one end of the new hangar, to provide much-needed extra floor space for storage of spare parts and assemblies (right). In January 2008 the first restoration work on Wessex 60 G-AVNE, started in the new hangar, alongside Wessex HAS.3, XM328, which had been transferred six months previously. Planning applications were approved by the local council, in June 2007, for two separate, single-storey extensions to the hangars, one of 200 sq.m (right), designed to house an archive, film theatre and classroom, a second of 35 sq.m, for toilets. Construction of these new facilities was funded from the Heritage Lottery Fund grant. The foundation work was finished in February, walls were up in March 2008 and most of the internal plastering, air-conditioning, and lighting, for the archive and education facilities, was installed by mid-May 2008. 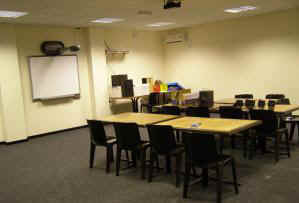 The newly-built education area (pictured above right) can be used as a film theatre, a classroom, or for private study. One of the first uses for the area was National Aviation Heritage Skills Initiative training for Restoration Volunteers in mid-June 2008. In August 2008 the screen and projection facilities were installed and set up for trials of a flight simulator system, intended for use by visitors. Agusta Westland have donated to The Museum, a number of interactive workstations, which will, using animated graphics, allow visitors to explore an aircraft, study aerodynamics and follow the history of helicopters. The first two workstations were installed in December 2008 and are now available to visitors. 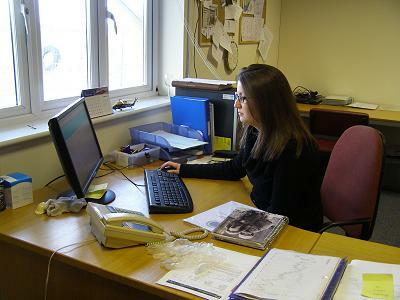 In May 2008 the first storage units were installed in the new archive and library area (above left) and the new Collections Officer, Kathryn Sherrington, started work at The Museum on 3rd September 2008. In 2002 the Museum announced proposals for building a new £1 million Learning and Discovery Centre designed to replace the existing wooden huts and caravans which have housed the cafe, retail shop, offices, archives and some of the introductory exhibits, for many years. In addition a top floor would contain classrooms/conference space and a new dedicated archive, with a technical library and storage for films, tapes and other media, which would have been partially sponsored by Rolls-Royce. The new building was to be linked to the Main Display Hangars. Plans for the development reached an advanced stage in 2003. The design and layout of a new introductory exhibition area were to have been sponsored by Agusta-Westland. Announcing the original proposals, back in 2002, Chairman of the Museum Trustees Elfan Ap Rees said "It marks the third and probably final major development for The Museum and is intended to be a prestigious building to properly reflect The Museum's status as the keeper of a collection now regarded as being of national importance". The total costs of the proposed facilities were expected to be around £1 million and a funding application for part of these costs was submitted to the UK Heritage Lottery Fund in 2003, following receipt of planning approval from the local authority. However, the Lottery Fund application was rejected in January 2004 and the Museum Trustees are thought to have been advised that, to stand a better chance of grant funding, they should re-submit the Lottery Fund application in 2005/06, incorporating greater emphasis on education, improved facilities and resource access. In any event, additional expense would have been incurred for the fitting-out of a function room, offices, shop and cafe, with funding and means yet to be finalised. Also, in 2003, The Museum received planning permission for a 670sq.m extension to its existing Display and Restoration Hangars. 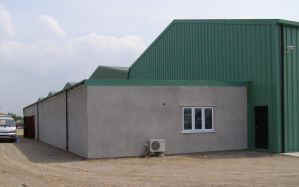 This was to allow a new and larger conservation workshop to be built to the west of the existing Display Hangars. The current restoration hangar (The Hafner Building) would then have become an additional, much needed, covered display area. The extension would have required a separate funding effort to complete although The Museum's share of the money raised at Helidays 2004 was allocated to the project. Another plan, put forward in 2004, was to develop additional new displays charting the history of aviation at Weston-super-Mare since the first visiting aeroplane landed on the beach in August 1911. The existing Museum is situated on a corner of the old Weston Airport and some of the surviving Airport buildings, including the wooden control tower, are only a few metres away from the Display Hangars. It was possible that, if these historic buildings, with adjacent land, could be acquired and refurbished, they might be used to house the proposed new exhibition and could, additionally, have offered an alternative site for a new restoration and conservation workshop. This would, in turn, have freed the existing restoration/engineering hangar for additional covered display or storage. Unfortunately, although the plan remains attractive for The Museum, negotiations with the owner of the land appeared to become 'stalled' and remained so for several years. The office space in the 1940s "Achilles" building had become increasingly congested so, in early 2005, The Museum acquired a second-hand mobile home, to provide additional accommodation. In August 2005 the Simulator Building structure, used for miscellaneous storage, was cleared, detached from its concrete foundation, lifted, and swung over to the other side of the "Achilles" (above left). 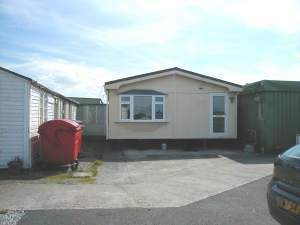 A few days later the mobile home arrived and was installed (above right) on the vacant concrete base. Connection of water, electricity and telephone services followed and the new offices were soon fully occupied. 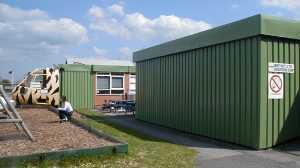 In September 2005 a 20-strong group of volunteers, drawn from Lloyds TSB staff, renovated the exterior of the "Achilles" and "Simulator" buildings, as part of a team-building exercise. The Helicopter Museum loaned four aircraft to the Royal International Air Tattoo 2003 which took place at RAF Fairford, in Gloucestershire UK, over the weekend of 19th-20th July 2003. In addition to the traditional flying displays the Tattoo celebrated 100 Years of Manned, Powered and Controlled Flight with an exhibition showing more than 100 of the world's most famous aircraft. 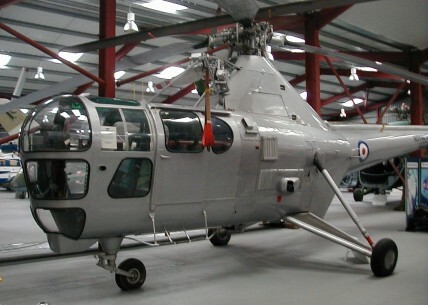 In 2001 The Friends of The Helicopter Museum undertook the renovation of this helicopter, intending to bring it up to a state in which it could be used as part of a mobile display unit. This unit could have helped to publicise The Museum and the Friends at appropriate events around the South-West of England. Unfortunately continuing difficulties and lack of team replacements meant that very little progress was made in the following years and the project has been terminated. The aircraft is to be offered for sale. Click for details with a report and pictures. The Friends site, launched in September 2001, is not intended to duplicate the Museum's official websites, except to a very limited extent. We aim to supply readers with up-to-date news of Volunteers' activities as well as frequent looks at recent happenings, with an emphasis on helicopter restoration and conservation, at the Museum. The site is also intended to appeal to a wider audience who can keep in touch on a regular basis and who may then be ready to join the Museum's Volunteers. We are still anxious to know whether you think this site is of value to you and to the Museum, whether you have any comments on its present form and content and whether you have any suggestions for its future development. Please contact us at:-- hmfriends@lineone.net --- if only to confirm that you can access the site satisfactorily, or to describe any problems. Its always good to know that you're there.